We welcome your comments on how we can improve our website to make information easier to find and understand. Please note that we are unable to respond directly to comments because all submissions are anonymous. For specific inquiries or complaints, please contact us via the iAGCO online portal. See the Complaints and Inquiries page for more information. The Board of the AGCO (the Board) is created and assigned functions and responsibilities by the Alcohol, Cannabis and Gaming Regulation and Public Protection Act, 1996. Appointments to the Board are the prerogative of the Premier and are administered through the Public Appointments Secretariat. As a whole, the Board brings a broad range of experience, skills and qualifications related to business, finance, corporate governance, regulation, adjudication and law, which allow it to effectively oversee the Agency. View the biographies of the current Board Members. The CEO, under the direction of the Board, provides leadership and direction to the staff of the AGCO. The Executive Office shapes the values, principles and major operating policies of the AGCO, provides strategic direction and leadership to the various operating Branches of the AGCO, and ensures the AGCO fulfills its regulatory mandate in an effective and efficient manner. Advice is provided to the Board, and the annual Business Plan for the AGCO is prepared and presented to the AGCO Board for consideration and approval. The Horse Racing Appeal Panel (HRAP) is an independent adjudicative body mandated to hear appeals of decisions made under the Rules of Racing. It was established on April 1, 2016 under the Horse Racing Licence Act, 2015. Members are appointed to the Panel by the Board of the AGCO. investigate serious racing violations, illegal gambling activities, horse abuse and deaths, and race fixing and other racing and rule infractions, monitor and enforce equine medication control programs and enforce Judges/Stewards’ orders and rulings. This Division coordinates and supports a number of strategic functions and informs regulatory direction through evidence-based policy making. By providing coordination, prioritization, planning and reporting functions through the use of leading practices, it helps to ensure that major projects stay on track and outcomes are aligned to strategic goals. The Division is responsible for the implementation of the change management framework, and transforming the organizational culture to support the strategic goal of providing a rewarding workplace. It provides leadership for the execution of a dedicated, strategic approach to stakeholder engagement and develops the AGCO’s Strategic and Corporate Plans. The Corporate Services Division provides strategic advice and guidance and key support services, including information technology, finance and administration, and human resources including the administration of the collective agreement. This Division provides strategic communications advice and services by implementing corporate programs to manage media relations and the AGCO’s public reputation. This includes overseeing the development of internal and external communication materials and publications to ensure consistency in messaging and presentation. Key to this role is managing and overseeing the AGCO’s website and Intranet portal. The Division supports the building of understanding and acceptance of organizational objectives and policy priorities through regular communication with staff. It also acts as the primary liaison with government to support government programs and initiatives and to manage issues. The Corporate Secretariat responsible for Board support also resides within the division, and assists the Board in fulfilling its policy and governance responsibilities. This includes ensuring that key corporate accountability measures, such as preparation of the Annual Report, are completed within government timelines and monitoring compliance with the memorandum of understanding (MOU) between government and the AGCO. This area also includes staff tasked with the administration of the Horse Racing Appeal Panel, the members of which are appointed by the AGCO Board. The Investigation and Enforcement Bureau is comprised of approximately 160 Ontario Provincial Police Officers, fully integrated as a Bureau within the AGCO. 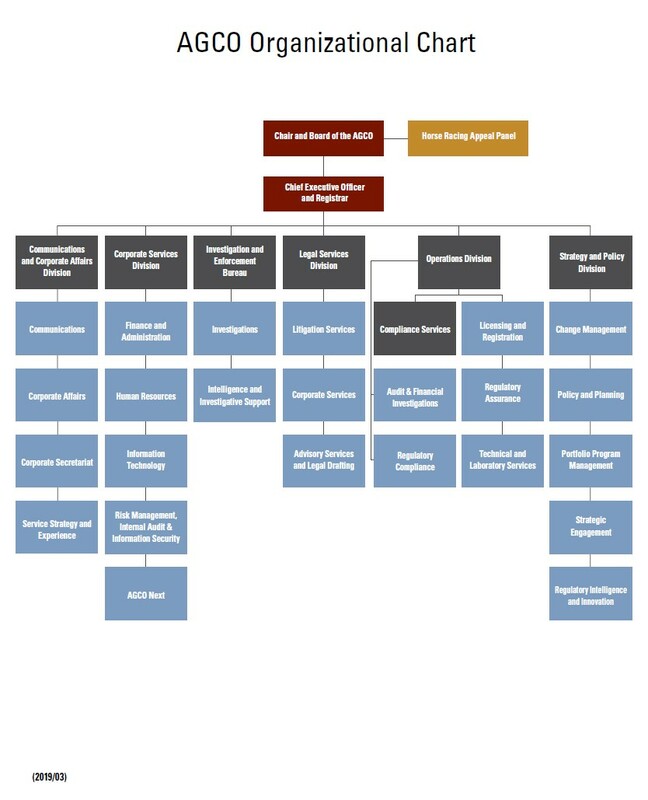 The Bureau’s three branches are responsible for conducting criminal, provincial and regulatory (eligibility) investigations across all lines of business regulated by the AGCO. It also provides investigative expertise and effective information sharing to external law enforcement, regulatory and industry stakeholder agencies, to ensure integrity and public safety within these regulated industries. The Division provides a broad range of legal services such as reviewing Notices of Proposals, representing the Registrar and Deputy Registrar at hearings, providing advice and opinions to AGCO staff and on corporate issues e.g. Freedom of Information, drafting legislation and contracts, and assisting in policy development. Counsel represent the Registrar of Alcohol, Gaming and Racing at hearings before the Licence Appeal Tribunal and the Horse Racing Appeal Panel and prepare appeals to the Divisional Court and to the Court of Appeal.